Not the best pub I visited on this trip, but not the worst. Jimi Hendrix in the background will always hook me. The young staff served reasonably efficiently, not hard as there were few in, but seemed oblivious to customers & preoccupied with their hair/smartphones/gossip. A pint of something called Country Bitter tasted OK and was 4.10. After a 2.90 pint at the Princess Louise, and an engaged bar person, the comparison was not favourable. DONT GO HERE... I had read the reviews of the Old Crown House and decided that the poor service comments were one-offs or disgruntled customers and that it couldn't be that bad. I was very sorely mistaken. I made a reservation yesterday which apparently was not recorded and not honored at the pub. That happens from time to time and usually not an issue. However, here we tried to clarify with the bar staff and they were so incompetent and incoherent that they could not, or would not, engage us in a discussion to sort out a table (which shouldn't have been a problem as there were ones available). In addition, they were uncomfortably aggressive towards us trying to find an alternative table, which ended in us being called liars and being refused to be served. The management would not engage with us meaningfully/constructively even trying to understand their issue and we were not served thereafter. I am a professional in my work life and have never come across such (i) incompetence, (ii) rudeness and (iii) utter lack of integrity by an establishment. I am a person of color and I left wondering if there was more to the episode as it was nearly otherwise inexplicable. If you have money to spend in London, please do enjoy yourself and your evening at another establishment. There are too many wonderful and enjoyable places in London than to waste time here. 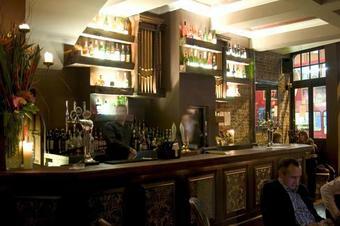 I held a party here recently and the staff were really friendly and helpful. The food is also fantastic - amazing burgers and hotdogs. Definitely worth a visit if you're in the area for the food alone. Very unusual, somewhat eclectically decorated bar (rather than pub). Now, I'm an avowed pubgoer, but this place won me over by friendly service and a cracking Hatveys Best. Nice pub - good service and wide variety of beers. 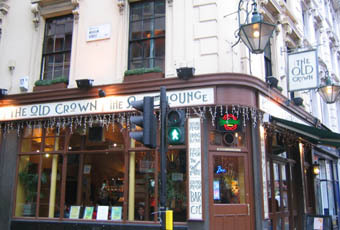 Can get very busy, but hey, its the centre of London... recommend the burger (often go there for lunch as work nearby).